If you think that acorns are just for squirrels, then it's time to think again. 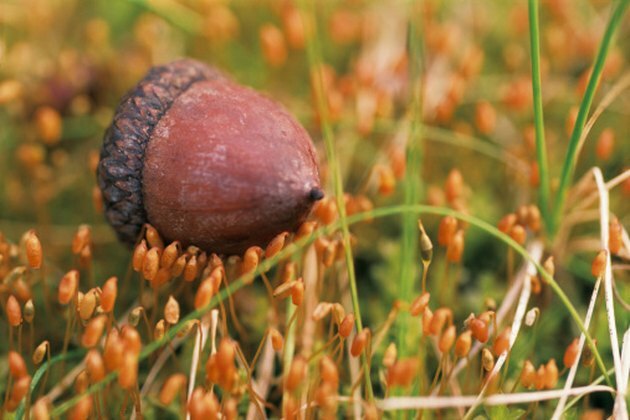 Native Americans have a long history of consuming acorns, and the Japanese used this nut to supplement rice during World War II, according to EatTheWeeds.com. These oak tree fruits contain healthy levels of carbohydrates, protein and fiber. Four ounces of acorns has about 500 calories. Acorns contain bitter-tasting tannins, so you must prepare, treat and cook the nuts before you eat them. Select acorns to cook. Refrain from choosing acorns with big caps, as they tend to be very bitter. Acorns from white oak trees are typically mild and slightly sweet, while those from red or black oaks contain more tannins and are quite bitter. The Redhawk's Lounge website suggests that you not harvest any acorns without caps because they usually contain worms. Clean your acorns. Fill a large stockpot about three-quarters full of cool tap water. Dump the acorns into the pot. Take out any floating acorns because these typically contain weevils or worms. Gently stir the acorns with a wooden spoon. Pour the nuts into a colander and rinse under the tap. Soak the acorns. Refill the large stockpot three-quarters full of cold tap water. Pour the nuts into the pot and let them soak for a minimum of 1 hour to soften the shells. Drain your acorns in the colander and pat dry with paper towels. Shell your acorns. You can shell the nuts by using a nutcracker or hitting them with a clean hammer. Separate the acorn meat from the shells. Throw out the shells and caps. Leach your acorns to draw out the tannins. Bring two large stockpots to a boil. Pour the acorns into one pot and let it boil until the water turns dark, usually about 15 minutes. Carefully transfer the acorns to the second pot of boiling water and boil the nuts about 15 minutes. Refill the first stockpot and bring it to a boil. Keep transferring the acorns from one pot of boiling water to the other until the water stays clear. Drain the acorns in the colander and let cool for about 10 minutes. Preheat your oven to 350 degrees Fahrenheit. Pour the acorns into a single layer on an ungreased, rimmed cookie sheet. Cook the nuts for about 60 minutes or until they turn a chocolate brown color. Remove the acorns from the oven and let them cool. Salt to taste. Mix cooked acorns with raisins or other dried fruit to make a trail mix. Substitute acorns for chestnuts in baking recipes. Do not rinse your acorns with cold water during the leaching process or you'll bind the tannins to the acorn and they will turn out bitter. How Many Calories are in Boiled Peanuts?